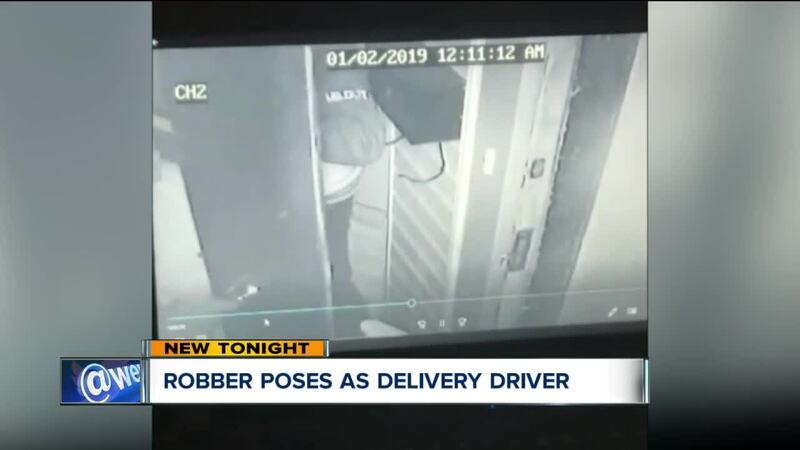 CLEVELAND — Two Old Brooklyn residents were allegedly robbed by a man posing as a delivery driver, and then were shot at in their home, according to a report from Cleveland police. The residents told police that on New Year's Day they came back to their home located on Mayview Avenue around 11:00 p.m, when they were approached by an unknown man carrying a large tote. The man approached them on their porch asking if they ordered Door Dash. They replied no, according to the report. The man dropped his tote and pulled a handgun from his back and pointed it at the couple, police said. Shortly after, two more men arrived to the home, demanding the woman hand over her house and car keys. The two residents were forced into their home by the three men, the report states. According to the report, the men stole the male resident's driver's license, Social Security card and credit cards. They also took the female resident's phone, house and car keys, and wallet, the report said. While the three men looked around the home, the couple ran towards the back door, attempting to shut it behind them. That's when one of the men started firing shots towards them, striking the male resident on the right side of his torso. The man and the woman proceeded to run out the back door and down the stairs. The three men fled the home through the front door and onto Mayview Avenue. It's unclear at this time if the suspects fled in the vehicle, but the residents told police that they saw the three men enter a white four-door sedan prior to their interaction, the report states.